In May, some rainfall shortages at Manilla became "severe". In June, they may perhaps become "extreme". One remarkable fact revealed by the graph is that no rainfall total, from one month to 360 months, rises above the median. This has not happened since 1947. It's been a very dry 12 months in Sydney, where lack or rain is not normally a problem. Here are the rainfall numbers for Sydney Airport (66037) for the 12 months June 2017 - May 2018. The Sydney Airport station is on the shores of Botany Bay, about 8 km from the open ocean and exposed to often rain-bearing Southerlies. 1. The annual total (June - May) is just over half the annual average, less than the 5th percentile of the long term annual average (Jan - Dec). 5. An extended 4 month dry spell from mid June to mid October during which only 52 mm fell compared to an expected (average) of 303 (i.e. 17% of average). One feature of much of Sydney's rainfall over the past year or so is the way that it has been concentrated on the coast. An inland station like Bankstown (about 17 km West of the Airport) would have done even worse. Steve, we agree that September 2017 was very dry. Here the rainfalls in October, November, December and February were all above normal. In your case, they were not quite up to normal. What’re the means/medians? Averages can be misleading. EDIT - comment: monthly medians are about 80% of averages, although the annual median is only 4% less. It tend to balance out over longer periods. Very much below here all the rain that has been around has been coastal.All creeks and cattle dams are dry here I am 10kms SW of Cessnock. Slightly above average rain here over the past 12 months. A very dry Jul-Sep period was followed by a rather wet Oct-Dec. A very wet March countered a moderately dry Jan-Feb. The very wet December was courtesy of numerous thunderstorms, and March's high rainfall was from a coastal trough combining with a decent onshore flow on two separate occasions. If there's no more rain for the rest of June here, the yearly (12-month) total will fall to be 5mm below average, or: 99.7% of the yearly average / 104.1% of the yearly median. The 3-month Apr-Jun period would be somewhat below average. Btw, monthly means/medians will not cumulatively add up to the yearly mean/median. The yearly mean/median is calculated from the yearly rainfall amounts received, and isn't the sum of the monthly means or medians. "...parched western NSW, where some places are experiencing their driest year to date in more than five decades." That may be not nearly so bad as it seems. At Manilla, which is likely to be typical, the last five decades were by far the most drought-free time in history. Extreme rainfall shortages have now developed for the first time since the drought of 2002. This was the longest period free of extreme drought at Manilla in the record beginning 1883. The really extreme numbers are further west. Broken Hill has had only 18mm for the year so far. Since around August 2016, a time that was very cold and very wet,we have been drifting into this drought. In late 2016, the drift was rapid. It reversed in early 2017, then resumed. July data will show whether records for low smoothed rainfall anomaly and/or high smoothed day temperature anomaly will be broken. More in this post on my blog. This graph shows how very few extreme droughts, such as this one, Manilla has had in recent decades. Severe shortages are up to the 5th percentile, and extreme shortages are up to the 1st percentile. This fifteen-year gap without extreme rainfall shortages from 2002 to 2018 is without precedent at this site. Earlier such gaps did not reach five years. We never had it so good! Extremely dry air, tending to prevent rain, is shown by record low dew points. I calculate early morning dew points from minimum temperature and maximum relative humidity. These values were the lowest in my observations in nineteen years from April 1999. They are thirteen degrees below my normal values for July. Manilla is now in an extreme 5-month drought with little more rain than in the driest ever 5-month period from April to August 1888 (29 mm). If you are keeping count, you will have noticed that this undeniable evidence of an extreme 5-month drought at Manilla means that the five months of drought must have commenced with the month of March at the latest. Yet I, for one, did not identify an oncoming drought at Manilla until May (as in the thread title). This is a feature of droughts: they cannot be identified until they are already in progress. Even then, to identify a long-term drought requires more months of rainfall readings than to identify a short drought. The thing is, the rainfall here was 26 mm in March and 18 mm in April. So the March-April mean of 22 mm, while it just qualified as a "severe" 2-month shortage, was very far from an "extreme" 2-month shortage. Now, at the end of July, we can see that the 5-month rainfall total of 58 mm (an average rate of 11.6 mm per month) is not just a "serious" 5-month shortage, but one of the most extreme 5-month shortages in history! The blue line is the actual monthly rainfall, the red line is the long term mean and the grey line is the median. Sydney finished with 694 mm for the year, about 57% of average. Every month except June had below average rainfall, February and March were near average. September was almost rainless, very unusual in Sydney. Much of the last year's rainfall came from Southerly influences, which dump lots of rain on the coast which doesn't penetrate inland. Sydney is located on a headland in the Harbour about 7 km from the open sea. Bankstown, about 25 km from the open sea, received just 330 mm for the year, semi-arid stuff, about 38% of the average. This is not directly related to the thread on rainfall shortage, but nonetheless relevant for drought as farmers would experience it. There is a stark contrast in year to date estimates of potential and actual estimates of year to date evapotranspiration in BOMs AWRA model. The year to date potential evapotranspiration estimate shows very high potential ET across much of NSW. Which means conditions have been favourable to dry out the landscape moisture. The year to date actual ET estimates shows below average to very low estimates of actual moisture lost through ET. The actual ET can be much lower than potential ET simply because there is no moisture left to be lost. That is you can't lose water to ET when there is no water left. Root zone soil moisture estimates align to this. Your three links go to BoM web pages showing an outline map and legend for (for example) "Root zone soil moisture", but they show no data at all. What do you have to do to see the data? When you said "Root zone soil moisture estimates align to this. ", did you mean that it is the potential or the actual evaporation that aligns with the soil moisture? Regarding the links. That seems odd as they show colour shading when I see them. You can click on the map and get a time series plot (for a point or catchment) and download the data as well (note though it says with compatible browsers Chrome, Firefox, Opera). The page also allows you to see daily value, monthly aggregation, or calendar year aggregation, and change the display between the numeric estimates (labelled 'actual') or relative which displays percentile ranks. What I meant, in "root zone soil moisture align to this" is that the root zone is very dry which aligns to the observation that while potential ET is high, the actual ET is low because there is not much moisture left to be lost to ET. For example near Dubbo (I clicked on pixel 32.00 deg S, 148.70 deg E) for July 2018 totals, Potential ET was about 98%ile rank, actual ET was about 2%ile rank, and root zone soil moisture was below 1%ile rank. Very dry conditions. The good rain news for Sydney is that so far this September (since 9:00 yesterday) we have already exceeded last September's rainfall by a factor of 10. The bad news is that in last September Sydney was virtually rainless, recording just 0.2mm. Like July, August across Sydney was very dry, with most sites recording about 10-15% of average. August rain prevented six-month totals from approaching the record of 43 mm set in 1888. I have drafted a graph like the one above (August 2018) projected for September using dummy rainfall totals. Remarkably, the September total (8.8 mm up to the 11th) will have to exceed 17 mm to avoid breaking a record for rainfall deficiency. The record, which has stood since 1912, is the 15-month total of 404 mm. That is a rate of only 27 mm per month: just half of the average monthly rate. "This lack of moisture in recent months has caused some places in western NSW to experience one of their driest years to date on record. Broken Hill's running annual total of 24.6mm as of 9am on Wednesday was its lowest to this point in the year since 1927 and the second lowest in more than 120 years of records. Wanaaring's 45.8mm of rain to date is its lowest total to this point in the year since 1982. Further east, Parkes was only up to 137.4mm as of 9am on Wednesday, making this its driest year to date since 1902 and the second driest on record." These near-record low figures for the year to date (8.6 months) agree with the shape of my August graph for Manilla (above). I have the 5- and 6-month rainfall totals as the most extremely low percentile values on the graph. Unless there is normal rainfall this month, Manilla's 9-month total will also be extremely low, but not record-breaking. The 15-month total may break a record (thus, below the 0.1th percentile). September figures for Manilla show that rainfall in the last 15 months is not just extremely low, it is the lowest ever recorded. A serious shortage at a duration of 20 years has also appeared, for the first time since 1949. Sydney did a bit better in September, with most places finishing about average (broadly defined) in what is admittedly the driest month of the year. The following are rainfall figures, with percentages being of median and average. Good rains fell across much of Sydney on the 8th, with Bankstown, which had been very dry this year, scoring a bullseye. However, Sydney's North didn't do so well. Parramatta is about 15 km North of Bankstown, about the sane distance inland. It missed out on the good falls of the 8th. On these maps, the greatest rainfall deficiencies in the area of the "North-west Slopes and Plains" match well to my "Rainfall Shortage" graph (above). The Bureau does not present analysis of 15-month deficiencies, which happen to be the most extreme deficiencies at Manilla just now. However, the 18-month deficiencies on the maps are much worse than the 12-month deficiencies, as on my graph. Deficiencies for other durations also agree with my graph to a large extent. We are not yet into restrictions with Hunter Water, and will require a few more months of low rainfall for that to be the case. Still, we will see what happens with the upcoming event in the next few days, as long term rain forecasts were not good. This drought is a failure of the winter (westerly) rainfall mode only. A partial (late) failure in 2017 reinforced the near-total failure of 2018. That accounts for the record low 15-month rainfall at September 2018. October figures show that there is now no serious rainfall shortage at 1, 2, or 3 months duration, but there is an extreme shortage at 24 months duration, such as has not been seen for half a century. Blog post: "An extreme 24-month drought". I find the lack of interest here strange. It seems to me that this NSW drought is worse than the "millennial drought" of Victoria that received so much attention. There is plenty of discussion in the day to day thread re the drought, and how tough rural NSW is doing it, and how we all hope that things will improve. The discussion doesn't need to be in two threads. Your records are interesting and I'm sure followed my many here on this forum, including me. I expect that's because it's started raining again in Sydney and on the coast. Everything looks nice and green around here so City and town dwellers assume it's all OK now. Of course, it's more complex than that, our friends in the Hunter and Wagga don't seem to be doing so well. It hasn't resumed raining everywhere and even where it has, it was a long dry before then. Thanks for the encouragement, Homer and Steve777. I am a beginner in the study of droughts. My material is a list of monthly rainfall totals from just one station. On that I have built a table of cumulative totals and another table of percentile values. That is about it. This material has led me to various facts that I did not know. Such as: long droughts of a given percentile value of rainfall deficiency have very much higher rainfall rates than short droughts. I hope that others will add to the discussion with other facts about droughts, and this drought in particular, that everyone would benefit from knowing of. One farmer said that his bore was still flowing well. That surprised me, given the extreme rainfall shortages at one-year to two-year durations. Can bores hold out until the drought extends to a decade? I suppose history would tell us that droughts rarely last a decade, but in this climate, one would never know. I doubt that bores could hold out that long considering they require ground water to replenish themselves. Please continue to add your thoughts. I'm sure many here are interested in your stats. I'm not sure that us city folk assume "everything is ok" just because we have had some good rains lately and everything is green. Maybe, those that are uneducated and don't care, but generally, on this forum, there is a large deal of sympathy for the rain deprived country folk. That includes Tamworth. The only droughts at Manilla in recent years to compare with the 2018 drought are those of 1994 and 2002. This is the contour chart for the 2002 drought. Extreme shortages did not exceed 12 months duration in that drought. Unlike the 2002 extreme drought, this drought is now revealing (or generating) rainfall shortages of more than six years duration. The Keepit Dam (built 1960) has not had to cope with such shortages before. I hope this graph helps to make sense of the drought situation. Rainfall totals up to six months are no longer serious shortages below the 10th percentile. Fodder may be still sparse, however, and sowing crops risky. Longer-term rainfall shortages are still getting worse. The 18-month total of 536 mm is the fifth lowest ever. All four lower readings were in months of 1966. The major water storage at Keepit Dam is below 1% full. The six-year rainfall total of 3042 mm to January 2019 was the lowest in a century. The only lower totals ended in the months January, February, and March 1903. While rainfall totals for the last six months are not "serious" shortages, they are driving all longer term totals down, to become serious shortages or worse. The extreme droughts of 12-month, 15-month, 18-month and 24-month duration that had appeared in October 2018, recurred in January 2019. The last six months were dry enough to replace similarly dry months in 2017 or earlier to produce extreme rainfall deficiencies again. Two rainfall totals to February 2019 were the lowest ever recorded at Manilla NSW: 271 mm in 12 months, and 3672 mm in 7 years. Thats pretty scary stuff now Surly, I believe you guys are on level 3 water restrictions? I know lake Keepit is all but dry, at about half a percent, what are the other dams sitting at? On the Namoi, Keepit Dam, which is the main water storage, is at 0%, and the back-up storage at Split Rock Dam is at 3%. On the Namoi tributary, the Peel River, Chaffey Dam (which supplies Tamworth) is at 30%. Further north, on the Gwydir River, Copeton Dam is at 12%. Yes, we are on Level 3 water restrictions. That does not affect me at all. (2.) My car doesn't get washed more than once per year, and not every year. (3.) My garden is practically all plants local to the area, and they need no watering, even in drought. In the district there has been a widespread die-off of silky oak trees (Grevillea robusta). They are native to the Gold Coast, a more soggy area. Water users, particularly irrigators, tend to fall back on increased groundwater use when drought makes surface water scarce. Is it being all used up? It seems that we don't know. The most recent rainfall status graph for Manilla NSW (posted above on 1 March) shows a 10-year rainfall total of only 5826 mm. Had the rainfall in the last ten years been at the average rate of 652 mm per year, the total would have been 6520 mm. The actual rainfall was 694 mm less than that. That is, total rainfall in the last 10 years has been only 89% of the 136-year average. Do we have as much groundwater in storage as we once had? That 10-year total is a severe shortage, such as has occurred in less than 5% of history (1946 and 1920, for example). At this time, there are also serious shortages (below the 10th percentile) at the even longer time scales of 12 years, 15 years and 20 years. Does it matter? Perhaps we are about to find out. A quote from the link had a critical point -- how can someone manage, let alone envisage the future of groundwater / surface water supplies without measurements and monitoring? There is some hope on the horizon in looking at a cross-section of the latest runs from the major models. It is showing significant inland troughing after Trevor makes its way inland after crossing the NT coast. It gets picked up by a series of upper troughs and depending on what model you look at, it variously washes out over central Australia, but, significantly some models are having it wash out over the Darling basin. It will be worth keeping an eye on in the coming week. The latest forecast for Charleville on the Warego River in the upper reaches of the Darling River look good for some significant rain (100mm plus) into the system for the first time in a long time as a result of ex-TC Trevor. 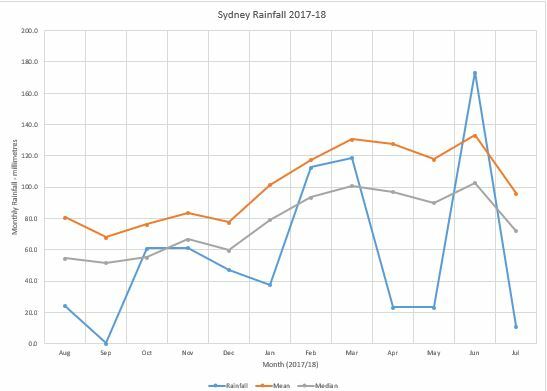 Here are Sydney's rain numbers for the period April 2018 to March 2019 (Observatory Hill 66062), compared to means and medians for all years. The last few days of March should not materially affect the result, the pattern or the conclusions. Because of missing data, I used the Comparison site (66214) for June. The 12 month period started out dry. We had an isolated wet month in June before the Dry returned with a vengeance for the rest of Winter. The rain returned in Spring, and this actually seems to mark the end of the drought in Sydney. Over 40% of the year's rain fell from October to December. January and February experienced what might be described as "low average" rainfall, a pattern which continued into early March. It's been quite wet since March 13, having rained just about every day since then. So is the rain back to stay? We'll see. EDIT: maybe we should change the thread title to be more generic, e.g. "NSW rainfall shortage" (drop May 2018). The plot of the severity of rainfall shortages at Manilla at March 2019. As "Inclement Weather" said was likely, we got some heavy rain at the end of March: 40 mm here. As this graph shows, that rain affected only the 1-, 2-, and 3-month totals. There had been six extreme shortages on the February graph, and there are still six on the graph for March. I define extreme shortages as totals that are in the lowest 1% of historic rainfall totals. Some shown here are in the lowest 0.1%! The current extreme shortage in the 7-year rainfall total may not recover to normal in decades. As Steve777 says: "We'll see." Does Sydney currently have significant rainfall deficits in the one to seven year range? For January to March 2019, rainfall has been slightly above average, with a wet March making up for modest shortfalls in January and February. Sydney had 96.5% of its expected rainfall in the 10 years 2009 - 2018. The pattern has been lumpy, with some dry periods lasting two or three months, but it seems to be balancing out with some very wet months, especially in Autumn and early Winter. The driest year was 2014 with 74% of the annual rainfall. The two calendar year period 2017-2018 was somewhat dry, receiving 85% of the rainfall expected over two years. But that's Sydney, the wind just has to turn onshore and it is likely to rain. We also get rain from Easterly influences like East Coast lows and Easterly troughs. However, only a small amount of rain, if any, from those systems would penetrate beyond the Divide. Even East of the Divide it drops off rapidly with distance from the coast. The situation in, say, Bathurst or even Richmond might not be as rosy. Steve do you have any numbers on the rain days and it's deviation from the mean, because I feel it is an important number in terms of evaporation rates and run-off. Okay egg all over my mug with my 14 hr dry period from this morning prediction. Steve777 has kindly given some figures for Sydney rainfall in recent months and years as percentages of normal amounts. He considers that the longer-term figures don't show much drought. I think that the longer-term figures may be rather worse than percentage values suggest. In the driest or wettest of times percentages of normal rainfall rapidly converge on normal as you consider longer periods. I have plotted out the driest times at Manilla in this graph, which I discussed in my blog here. As you see, by the time you are considering 10-year (120-month) totals, the record driest 10 years at Manilla (Feb 1937 - Jan 1947) had 86% of normal rainfall. I suspect that Sydney's rainfall is less variable. In that case, perhaps the driest-ever 10 year period in Sydney had more than 90% of normal rainfall. Steve777's observation of 96.5% of normal rainfall in the decade 2009-2018 could be a low value. Unfortunately, those maps show durations only up to 48 months. For the Sydney region, they tend to confirm the observations of Steve777 so far as they go. Someone should calculate Sydney's rainfall percentile values for the last decade and beyond. The question I have is, at what point to long term deficits not matter as much? Does going back ten years really tell us much? 100mm yesterday is more helpful for how the landscape looks now than 100mm a year or longer ago. Similarly, if there was a big drought five years ago which then broke and the following years were reasonably normal, what effects, if any, would the landscape be expected to be showing now even if there was a ten year deficit? I guess what I'm saying SB is a few good rain events and a better than average year in Manila and a ten year deficit might not matter? Thanks for the question, Jimi. Water storage over years or decades has become vital as our society has become more centralised and our water use more ambitious. I don't know, but I imagine that the managers and planners of Sydney water storages must think in terms of water security over very long time periods. The current crisis in managing the water of the Murray-Darling basin is not something that a wet month or two will resolve. Long-term rainfall shortage could also be lowering the water-table in ground-water reservoirs. We don't know much about that, and we could get a nasty surprise. This contour graph of rainfall shortages extends the similar graph (above) that ended in January. By March, there are still four durations on the graph that show extreme shortages. While the 18-month total is not now an extreme shortage, the 30-month total is. It is also a driest ever value (1078 mm) shared with October 1966. This graph shows how the current drought had its origin back in 2012 or earlier, but nobody noticed (especially me). "Water Availability in the Namoi"
The report was written in 2007, a decade before this drought struck. "The average total surface water resource in the Namoi region is 965 GL/year and on average about 359 GL/year (or 37 percent) of this water is used. This use is comprised of net surface water diversions of 260 GL/year and eventual total streamflow losses induced by groundwater use of 99 GL/year." That seems to me to be a great reliance on groundwater. That is, 99/(99+260) = 27%! And that is in times when there is normal surface water flow. It is interesting to see how they express it: when groundwater is used, that shows up as less flow in the rivers for use downstream. "This is a high level of development. Flows in the Namoi River are highly regulated; Split Rock Dam regulates 93 percent of all inflows and Keepit Dam regulates 77 percent of all inflows. Chaffey Dam on the Peel River regulates 41 percent of all inflows." With Keepit Dam at 1% of capacity and Split Rock Dam at 3%, I don't think that Namoi River flows are "highly regulated" just now. 7 registered (crikey, Dan101, LonnyDave, Adaminaby Angler, Steve O, mithrandir, Rhys. ), 69 Guests and 3 Spiders online.